Home » Our insights » Blog » Is the Ombudsman getting softer on banks and insurers? Is the Ombudsman getting softer on banks and insurers? 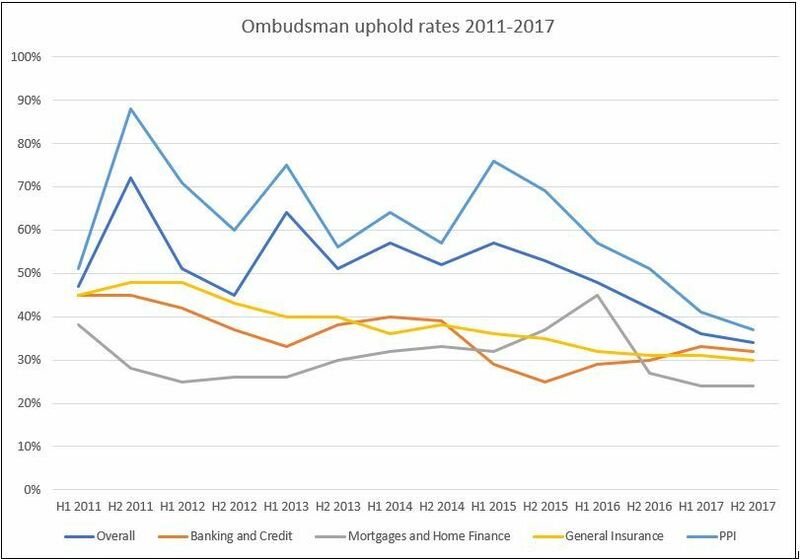 Average uphold rates at the Financial Ombudsman Service are falling. Is the industry getting better or the Ombudsman getting softer? 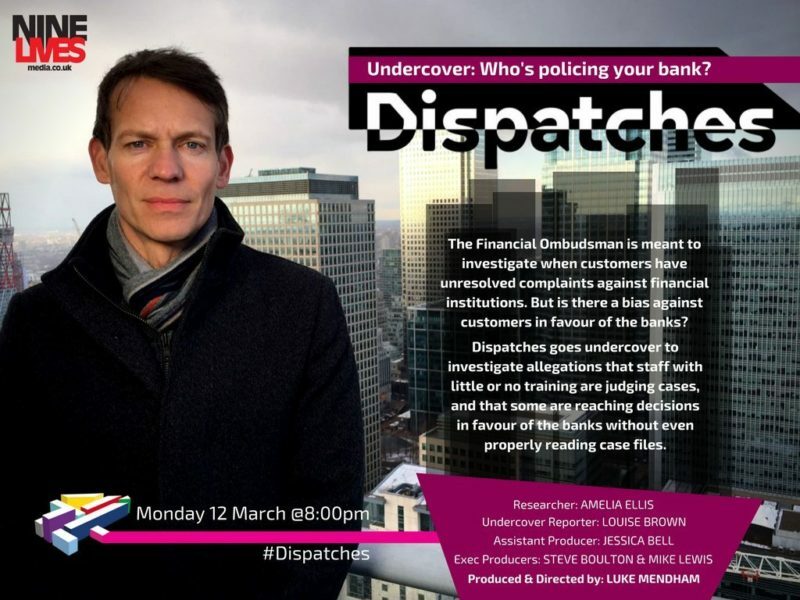 Last month's undercover investigation into the Financial Ombudsman Service raised doubts about the ability of the organisation to do its job effectively. Undercover footage showed that staff were under increasing pressure from rising caseloads, and not always well informed about the areas over which they were adjudicating. One worker who was interviewed said that it was easier to rule in favour of a company than a consumer - and suggested that when they were under pressure, that would be the default. I've already written about the documentary, but I was intrigued to look closer at the statistics to understand how things have changed at the Ombudsman since it started publishing data seven years ago. Below is a chart showing average uphold rates by core sectors since 2011. It's clear that uphold rates - that is the percentage of complaints being overturned in the customer's favour - has fallen over the decade. Overall, the uphold rate has fallen from 47% in the first half of 2011, to 34% in the last half of 2017. Excluding PPI - which has been something of its own beast given the very large volumes and the prevalance of claims management companies in the sector - the average has fallen in more of a straight line from 43% to 29%. Although the evidence shows falling uphold rates, it's not fair to conclude that this is evidence of a softening in the Ombudsman. The Ombudsman has been around for less than 20 years, and sectors like insurance and credit have not been under its wing for the whole length of its existence. Over the course of the last couple of decades, regulation has evolved. Big fines for misconduct have been handed out and company behaviour has moderated. Most major companies are no longer indulging in old school mis-selling. Instead, misdemeanours tend to be much more subtle. Take Vanquis Bank's recent £2m fine for not making the cost of its Repayment Option Plan clear to customers. Vanquis' omission may well have been by design, but I imagine that many customers would have bought the ROP even if they had known about the cost - such was the nature of the product. So Vanquis deserves its rap over knuckles, but it's not on the same scale as PPI or mortgage endowment mis-selling. Given the revelations in the Dispatches documentary, and the insinuation that the FOS is softening on companies, it's a wonder that uphold rates have not fallen further. Companies are improving but not nearly fast enough. For me, the problem continues to lie in companies struggling to understand what being fair and reasonable to a customer amounts to. I don't mean this as an accusation, as much as an observation. It can be difficult to build subtlety and empathy into a business' operations. In many cases, if a complaint crosses the desk of the CEO, they are baffled how their business took so many wrong steps up to that point. Culturally, the management set the right tone and understand how to treat their customers fairly. But translating that into systems and processes which ensure targets are met and costs are kept down can be challenging. The biggest difference that companies could make to their Ombudsman record is to better set customer expectations and be more transparent. We often say to clients that your responsibility is to give your customer every chance to make the best decision for themselves. If they don't do that, then responsibility passes to them. But to get to that point, companies need to much more clearly explain what their product does and what it doesn't. If their internal root cause analysis highlights a number of recurring pain points, those need to be drawn out in the purchase journey - so that every customer goes in understanding the area of contention. There's a fear that being open and transparent will result in a loss of business. But in our experience that's very rarely the case. In reality, customers are actually willing to give companies a lot more leeway if they are surprised on the upside. The insurers who are clearest about their renewal pricing will be the ones who have customers knowingly stick with them and pay over the odds because they don't feel anything is being hidden from them. Consumers are willing to make decisions that are strongly against their economic interest if they feel they can trust a brand. I don't know whether there are serious problems at the FOS. We'll await the results of the independent review with interest. But there's no need to have 25%-40% uphold rates in your business. If you do, you are sending an army of dissatisfied customers into the world with a story to tell about how you treated them badly - and it was only an independent arbitrator that rode to their rescue. If big firms like Nationwide can get their uphold rates down to a little over 10% - so can everyone else. And doing so is an investment in loyalty, brand, retention - all of which will pay dividends for the business in the long-term.